As low as $13.00 each* custom engraved heart paperweight if ordering 12 or more of exactly the same engraving and color. Prices will be adjusted to lower price after order is placed. Please call or email if you have any questions. Please call us for pricing on the higher quality sandblasting. Personalize with your names and date, logos or other message or image. Faceted, Gorgeous, Hand-Cut Glass Crystal Heart. Each diamond paperweight comes packaged in cardboard box with glued on fabric. (NOT a gift box) The boxes are either blue or red. 3.125 Inches in Diameter, 1.5 Inches Tall. Custom boxes are available. Color of heart may vary slightly from production batch and size. 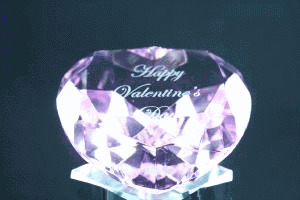 Sparkling crystal paperweights, cut to resemble a brilliant heart shaped diamond, are a popular gift for weddings, bridal showers and anniversary parties...Great for crystal awards, crystal gifts, custom awards, company awards, recognition awards, achievement awards and awards corporate. Each custom engraved heart paperweight comes packaged in a protective box which may not be suitable for a gift or presentation.Repackaging of the crystal heart or diamond paperweights may be necessary. Color, size, and cut of diamond may vary slightly. If you want a large quantity order for the crystal glass heart or diamond paperweights please contact David at 1-800-982-5992 or Davidl@incrediblegifts.com for discount prices. As low as $13.00 each* custom engraved heart paperweight if ordering 12 or more of exactly the same engraving and color. Prices will be adjusted to lower price after order is placed. Please call or email if you have any questions.